On this day in 1934, Tommy Loughran got his big chance against gargantuan heavyweight champ Primo Carnera. Dreams of such a 15-round title tiff was the thing that compelled Tommy to give up his light-heavyweight championship five years earlier. He took his shot and was in the fight for the first ten rounds, but Primo's eighty-six (86) pound weight advantage began to take its toll. The tough and stylish Philadelphian made it to the end of the fight - though barely according to some newspaper reports of the time. 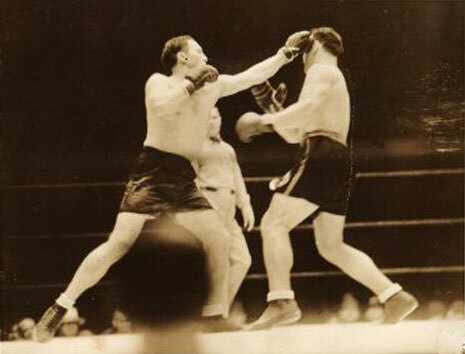 The decision was unanimous for Carnera and gave him his second successful title defense. It would be his last; three months later he would lose his crown to Max Baer. Loughran would never again vie for the biggest title in sports. He would however, become PA State champ the following year. In 1937, Tommy would finally call it quits after posting a 109-30-11-25 (17 KO) record from 18 years in the professional prize ring.